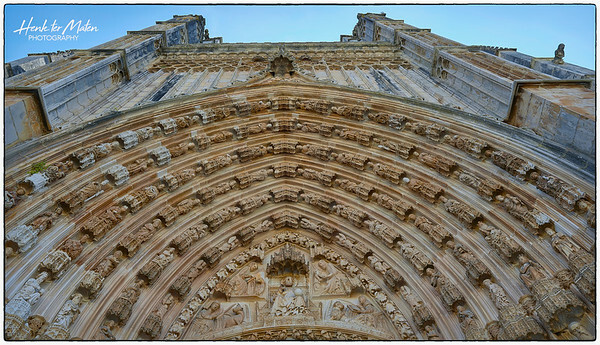 Detail of main portal with tympanum and archivolts.The portal shows in the archivolt a profusion of 78 statues, divided over six rows, of Old Testament Kings, angels, prophets and saints, each under a baldachin. The splays on both sides display (inferior copies of) statues of the apostles, with one standing on a chained devil. The tympanum shows us Christ enthroned, sitting under a baldachin and flanked by the Four Evangelists, each with his own attribute.